Chicken is such a versatile dish, you can stuff it with stuffing, as in Thanksgiving stuffing, or if you are doing LO CARB, like I am, I am stuffing this chicken with sauteed spinach, walnut pesto and goat cheese. This is a recipe that I know that I will make again and again, it is a perfect dish for when you have company. Serve with a big tossed salad and a bottle of Chardonnay. It looks very festive and like a lot of work, but it is just a couple steps and is very delicious! In a Cuisinart or Blender, add garlic first, pulse until chopped up, add nuts, pulse until combined, drizzle olive oil, while pulsing, then cheese, pulse until combined, then basil, blend until smooth. Add more Olive Oil if needed. Add salt and pepper to taste. Makes 2 cups. Preheat oven to 375 degrees F. Saute spinach in a saute pan with 1 Tbsp Olive Oil until soft. Set out 3 shallow bowls. In one bowl beat an egg, set aside, in another bowl pour in Panko crumbs, in a separate bowl combine goat cheese, sauteed spinach and pesto. Cut a deep slit in the side of each chicken breast. 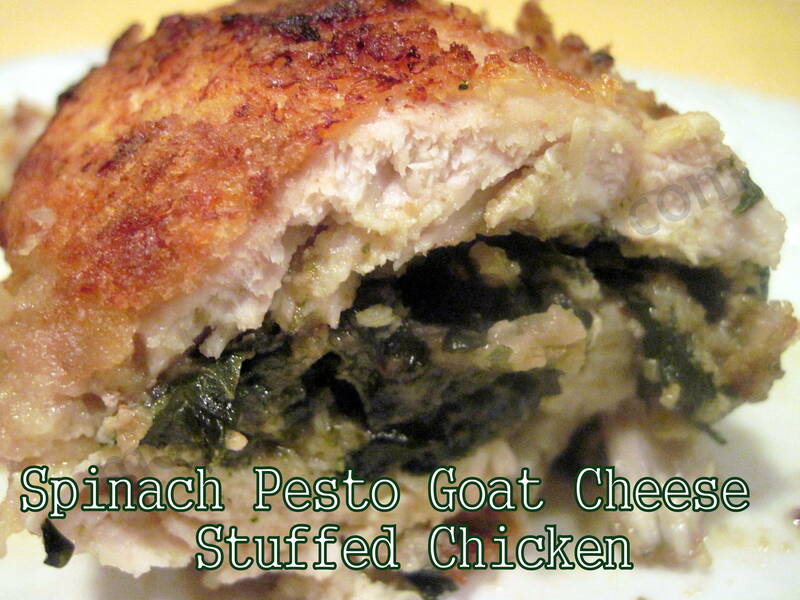 Stuff a dollop of spinach mixture into each chicken breast. Use toothpicks to hold the chicken sides closed. I used a lot of toothpicks to keep the chicken closed so that all of the filling did not fall out. Dip chicken in beaten egg to coat, then dip chicken in panko crumbs to coat. Grind salt and pepper over Panko covered chicken. Place chicken on a baking sheet covered with aluminum foil that has been sprayed with vegetable spray. Bake for 40-45 minutes or until golden brown. Let chicken set for a couple minutes after removing from oven before removing toothpicks. Slice the chicken in half to wow your guests. Serve! Posted link on my face book fan page for my readers, hope you do not mind…great recipe worth sharing!